William Feder Homes, Inc. has been building homes in the Greater Mankato and Southern Minnesota area for more than 40 years. With William Feder Homes's building experience and quality workmanship, you know you will move into a home that meets your expectations, specifications and requirements. No other home builder makes building a new home as joyful and absolute as William Feder Homes. We use a building system that allows us to guarantee pricing and on-time completion. As a William Feder Homes client, you will also have countless options to choose from for new home construction, giving you the opportunity to customize your home to suit your lifestyle. 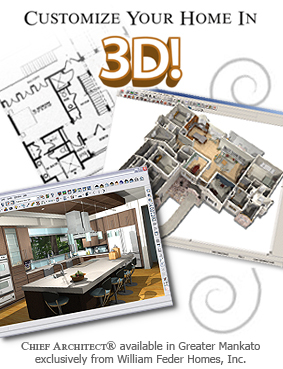 You can even view your plans using our state-of-the-art 3D home design software. LOCK IN EARLY 2019 NEW HOME BUILDING PRICES NOW! When choosing a builder to take your dream and make it a reality in 2019, there are many things to consider. Will your builder lock in prices? Will they give you an itemized list? Will they lock in a building schedule? William Feder Homes’ Price Lock Program offers the answers and peace of mind you need to make the home building process as straightforward as possible. Lock in early 2019 prices, lock in a building schedule and lock in value with William Feder Homes! Contact William Feder Homes now to lock in the price of your new home. Click Here to listen to a customer testimonial! Rated in the top 10% of 77,973 contractors in Minnesota!